Cold & flu season is upon us! And, given all the medical craziness our family has had the past few months, I’m doing everything in my power to try to avoid getting any of these respiratory viruses and/or lessen the symptoms once they hit! Baby Brother has had a Christmas cold, but so far (knock on wood), it’s been pretty minor and everyone else has stayed healthy. 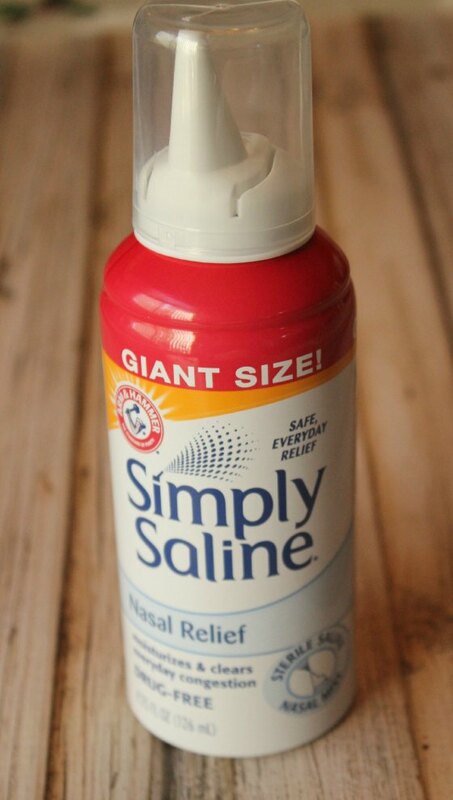 One thing we’ve been using to help fight the nasal congestion is ARM & HAMMER™ Simply Saline™. I love that it’s safe enough to give the kids! There really is very little over-the-counter cold/cough relief “medicine” that is deemed safe to give to the really little ones. But, my pediatrician recommends using a saline spray for the cold & flu ick. I love that the ARM & HAMMER™ Simply Saline™ has just two simple ingredients – purified water and salt. So, it’s safe for little noses too. 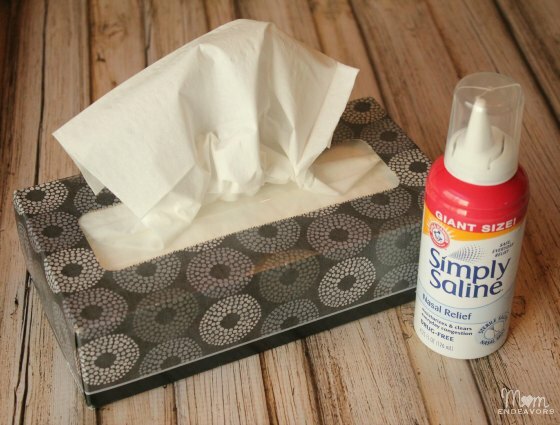 The kids certainly don’t like using it, but it really does help to flush out the yucky noses (and it doesn’t hurt that it almost always makes my little guys sneeze ;), which helps flush things out as well). The other benefit is that it helps moisturize the nasal passages, which is especially important this time of year. Heaters (and drier air in general) dry out all of our mucous membranes, making us more susceptible to those nasty respiratory bugs. So, this time of year especially, ARM & HAMMER™ Simply Saline™ is a must-have in our medicine cabinet! One lucky reader will receive an ARM & HAMMER Gift Pack fea­tur­ing 2–3 ARM &HAMMER products (some pos­si­bil­i­ties shown in the image below, based on availability) AND a $100 VISA gift card!!!! You could buy A LOT of ARM & HAMMER™ Simply Saline™ with that! Ha! Enter via the Raf­fle­copter form below. Open to US & Canada res­i­dents, 18+ years. Give­away ends on January 8th, 2014 at 11:59pm MST. 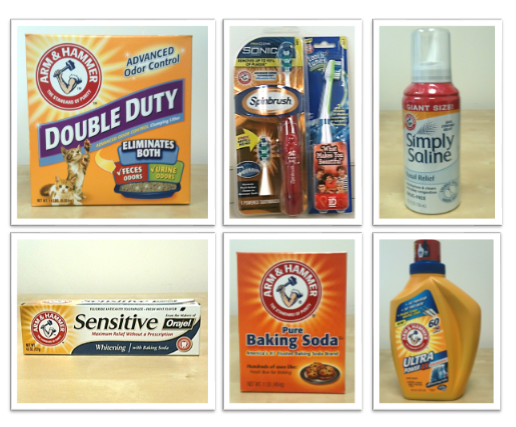 Down­load ARM & HAMMER™ prod­uct coupons here. wash hands, stay out of very crowded areas, take more vitamin c.
To wash your hands often and carry hand sanitizer. I read this tip recently. Take a pen out with you when you go shopping. A lot of germs are spread through the debit card keypad at the store cash register. Instead of punching in your pin with your fingers, use a pen. My favorite cold and flu tip: sleep it does a body good! A well rested body is better prepared to fight off cold and flu. Washing my hands frequently and taking my vitamins regularly! Wash hands especially when coming home after school/work/errands and always keep Purell in your purse/car. Wash your hands as much as you can! I carry hand sanitizer in my purse and take lots of vitamins D and C.
cold and flu tips – drink a lot of water, take vitamin c and avoid chills and dampness, and have a lot of tissues to cover coughs. Wash hands often, eat healthy and get plenty of rest. I try to eat healthy and wash my hands often!! My favorite tip is to wash your hands properly – for about 30 seconds and with hot water. I put garlic in a lot of our food and it really seems to help. We also take vitamins and wash our hands! Washing my hands and staying away from crowds when possible! Wash your hands frequently and take multivitamins! I wash my hands often and when I’m out I use hand sanitizer. Wash hands often and chicken soup. My best tip is to wash your hands, use antibacterial wipes in public places and drink plenty of fluids. My favorite tip is to wash your hands! That is the best way to prevent getting sick! Of course – wash hands! But cough and sneeze into the elbow is always a fun one. And cold/flu season is always rough on us asthmatics, so I always recommend paying attention when pollution advisories are high – stay inside and take care of your lungs! If you get sick, stay home! Don’t go to work, where you’ll make other people sick (and if you’re not well, you won’t be doing a good job anyway). Try to avoid even going to the store or other public places, too. Stay home and take care of yourself. Do not let yourself get dehydrated. Fluids, stay warm, and vitamins. You must stay strong to fight that cold. wash your hands a lot! at least every hour or so! Get your flu shot. Best prevention! What we do is we all wash our hands as soon as we enter our home after being out and about! Try to keep those germs away! You can’t do a lot when you are surrounded by germs every single day. Wash hands, don’t touch your face, stay home if you can, the same old things. But one tip I have is to always have chicken soup ingredients ready at home for a big bowl of comfort when a nasty bug does hit! Drinking lots of water, and taking vitamin d in the winter months. My favorite tip is to wash your hands often. Thanks for the great giveaway! Wash hands and use hand sanitizer. Always make sure to wash your hands. My favorite tip is really do eat chicken soup. There is not only the warmt from the soup but there really is something in hot chicken soup or broth that clears sinuses and chest colds. My tip is to wash hands frequently. My tip for the flu season is to practice good hand hygiene by washing hands regularly. I am careful to make sure i am getting enough Vitamin C! Eat as much garlic as you can! Keep a small bottle of hand sanitizer with you at all times – and use it! wash your hands and drink plenty of water. We take daily vitamins, wash hands often and get plenty of rest!